Triple Chocolate Pudding Cake Recipe - only 5 simple ingredients! 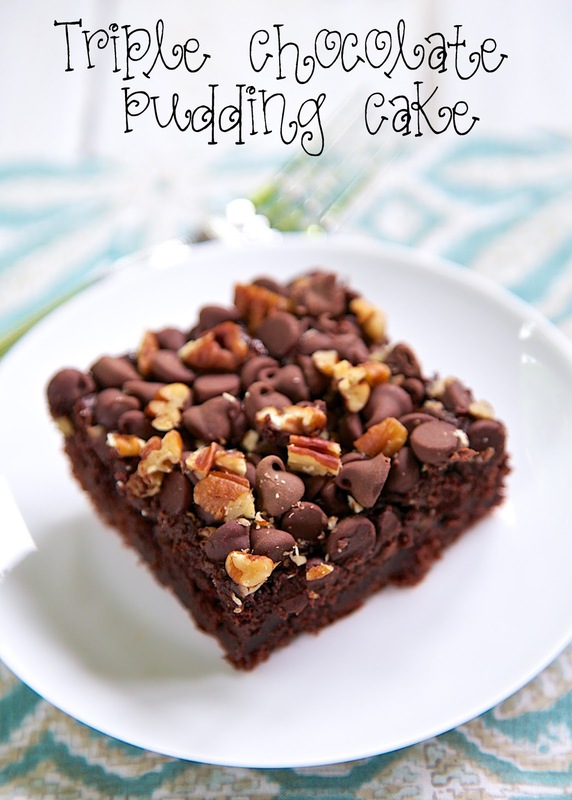 Pudding, Milk, Cake Mix, Chocolate Chips and Pecans - makes a wonderful fudgy cake! 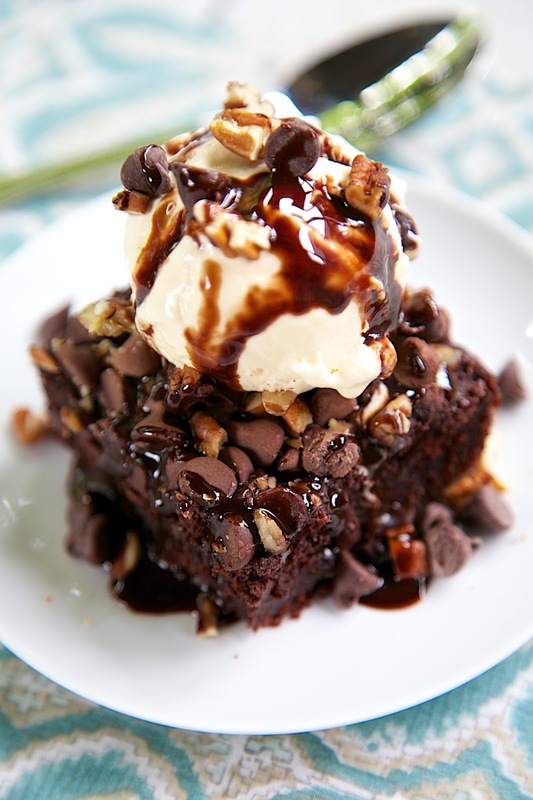 Great topped with ice cream and chocolate sauce. I made this cake for Chicken Legs' birthday last week and he loved it! This Triple Chocolate Pudding Cake only has 5 simple ingredients and tastes delicious! The preparation of this cake is a bit unusual. Simply prepare a box of Cook and Serve Pudding and then mix in a box of dry cake mix. There are no eggs or oil in the cake. Just prepared pudding and cake mix. I promise it works. It makes a wonderful fudgy chocolate cake. For Chicken Legs' birthday, we heated the cake slightly and topped it with vanilla ice cream and chocolate sauce. It was amazing! One note, make sure to use a box of Cook and Serve Pudding; NOT Instant Pudding. Combine pudding mix and milk in a large saucepan. Heat over medium-high heat until thickened. Remove from heat and pour pudding into a large bowl. Press plastic wrap or wax paper against the surface of the pudding and cool about 30 minutes. Preheat oven to 350 degrees. Grease a 9x13-inch baking pan, set aside. Remove plastic wrap from top of pudding. Stir in chocolate cake mix. Mix well, making sure there are no dry ingredients hidden in the batter. Pour batter into prepared pan. Top with chocolate chips and pecans. Bake for 30 minutes, or until a toothpick inserted into the center comes out clean. Cool completely before cutting. Our family has made a version of this for years. We use a can of "Thank You" brand pudding instead of the cook and serve and sprinkle a 1/4 cup of granulated sugar over the top at the same time as when you sprinkle the choc chips and nuts on.